It is with great sadness that we learn of the demise of Eskarina, who went to live with my daughter a few years ago. She was almost 17, a great age for a pedigree cat, but we all thought she would outlive the lot of us. Esk came to us in January 1998, along with her best friend, Pteppic. who died a couple of years ago. 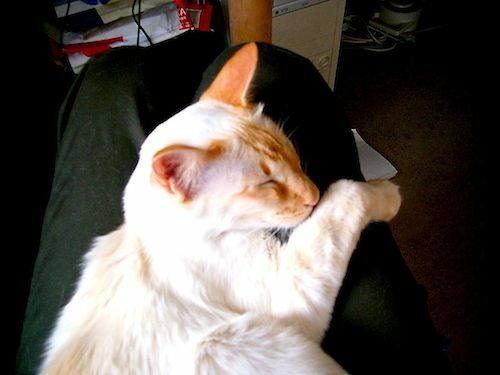 A cat of great beauty in her heyday, with apricot mask, ears, and magnificently plumed tail, and beautiful blue eyes, but somewhat let down by her voice, which resembled that of a corncrake. The whole family had a variety of different names for her: Wahbag, Baggage (in a French accent), EskCat, to name but a few. She really was a very old lady by the time she left us, but she still knew what she liked. Which was men. Particularly Pete, whose armpit she would nuzzle, while making a peculiar chirping noise. She was very hoity toity, and had a virtual lorgnette, over which she peered at people. in a disapproving manner. Curiously, my daughter was due to move house very shortly after Esk died, and I don’t think the Wahbag would have liked that *at all*. Go well, Eskarina – good hunting, and may your wah continue long and loud in the ether.